This past Saturday Ernie and I had a birthday party to go to but after working all day in the yard my whole body was aching pretty bad so I decided to stay home. Ernie decided to go to the party and had already bought a gift for the birthday girl but needed a card to go with it. I pulled out all my goodies and threw this card together. Very pretty! Love the butterfly paper. Hi Ingrid!mi saw your comment on Kristina's website & wanted to see what you came up w in such a short time. And success" I love what you created! Clean & balanced! 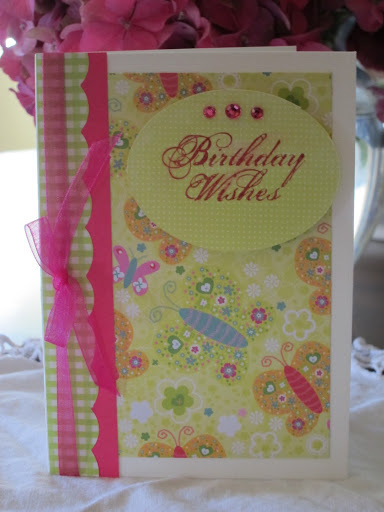 I've been known to spend wwwaaayyyy too much time on one card too-but hey-I love it!